Here’s a word of warning to anybody applying for a US travel visa or Esta online. The top search results in Google are not for the official application forms, but paid advertisements for commercial websites that charge more than five times as much as the government one. Regular travellers will know this has been going on since at least 2010. But after a BBC News investigation, Google has taken some of the ads down. Only some of them though. In 2010, the US started charging UK travellers to use the Electronic System for Travel Authorisation (Esta) before their visit. 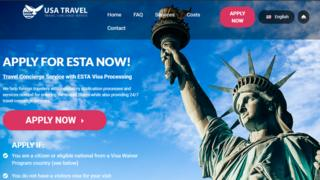 The official Esta website is run by the US Department for Homeland Security, which charges $14 (£10.70) for each Esta. But there are countless sites that charge more than $80 for the same application. One site advertised on Google charged $99 (£76) per Esta. Customers may still get their Esta, but end up quite severely out of pocket – and Google earns money in the process. The sites justify their prices by offering “24/7 support” to anybody who is struggling to type their details into the web form. The BBC sent Google several ads that appeared at the top of search results for terms such as Esta and US visa. Google said the ads did break its rules and would be taken down. But following the removal, the top search results were still ads for commercial sites – so the BBC reported those to Google too. Google said those ads would also be taken down. A third look found ads for service sites still remained at the top of Google’s search results – including an identical copy of one Google previously said had broken its rules. The ad was taken down for investigation, while others remain at the top of Google’s search results. Since the commercial websites are charging for a service and do submit your Esta application on your behalf, it is difficult to get a refund if you have paid more than $14. Consumer advice site Money Saving Expert says to look for the official Esta logo, which is a trademark and can only legitimately be used on the official Esta website. Google told the BBC it encourages the public to report advertisements that break its rules. The BBC asked Google why it did not “pin” the official Esta website to the top of its search results, or highlight it more prominently. It said its search results were determined by algorithms.